As well as actual gardening, and working with Willow (see below) I supply a small, carefully chosen range of plants of consistent quality: all are propagated by me, here in South Oxfordshire, and all are strong young plants, which are accustomed to our local climate. Most plants are in 2 litre pots: that's about 5" (13cms) across the top. They are well established, well rooted, and can either be planted out straight away, or can be left in their pots until you are ready to plant, but as with all pots, you must remember to water them, even if it rains! I am currently looking for a new site for my plant nursery, so in the meantime I have a much reduced selection of plants for sale: they are listed on www.GreenPlantSwap, along with full details of where they grow, what conditions they like, how to manage them and so on. If there is something of interest on the list which you would like to see, do e-mail me at Inquiries@rachel-the-gardener.co.uk, to confirm availabililty. Should you require a border or bed to be dug over prior to planting, that can be arranged, as can planting out of your new purchases if required. Just e-mail me at Inquiries@rachel-the-gardener.co.uk with some idea of what you want done, and I will give you an idea of cost and timescale. Please note: all plants listed are subject to availability. So, what was that about working with Willow? Willow fedges are a combination of fence and hedge, with the benefits of both: sturdy enough to keep children and good-sized pets safely inside, open enough to allow wind through, preventing turbulence damage to the plants within, and interesting all year round. In summer they are lush and leafy, and when trimmed back each winter, the pleasing structure in revealed. I love installing fedges, and it is always interesting to see how they develop. They do need to be cut back each year, and any damage made good, but that is a small price to pay for such an interesting element in the garden. This one (left) is shown here newly installed, with optional landscape fabric at the base to suppress the weeds. It was created to disguise the unlovely oil tank which was otherwise prominently displayed, and to separate off a small area of the garden to make a more private sitting area in summer. Fedges can be curvy, as here, or straight: they can also be domes, or tunnels for children to run through, or combinations of all elements to make lively outdoor gyms for all sorts of fun. What I particularly love about Willow work is that normally, you plant a tree for your grandchildren to enjoy when they grow up. But willow grows so fast that they can enjoy it now - and so can you! 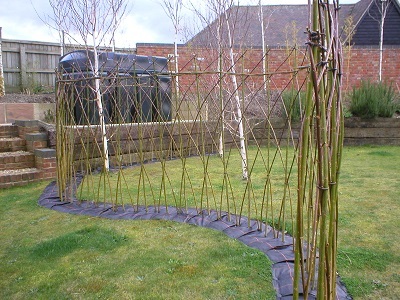 If you are thinking about planting or installing a Willow creation in your garden, e-mail me at Inquiries@rachel-the-gardener.co.uk to discuss the cost, the preparation, and the upkeep.